I hope that you are all going to have a great 2016. I think for me 2015 was a very good year, we got the vegetable garden to a higher level than the year before. Of course not everything grew as I would have hoped but I will keep trying and maybe learn for those things that I did not get right, can not say I will, sometimes for me it takes a few goes. I would like to say a very big thank you to Thomas for all of his support and help this past summer, it meant a lot to me. I also want to thank my dear friend who gave Great Dixter financial support to give me help up in the garden, thank you so much you know who you are. I am on nursery duty over the holiday period. I am happy to work because I take most of February off so have to do my bit before I go away. I also enjoy spending time down in the nursery while no one is around, looking at the new plants and seeing all the seedlings in Michael’s house and all the different cuttings on the heated benches. There is not a lot to do with the weather so mild, so many of the plants under glass could be out in the open. I have taken all my tender plants out and still have not needed to put them back in yet. Christopher was very good about growing plants hard so you have a stronger plants to sell and for the garden. I am enjoying looking through the latest copy of Salon. It is a pleasure to look at the photos and layout of the magazine which is a good thing because it is in German. I can not read German so it is just a case of looking at it. It maybe worth me taking a German lover so I can have the magazine read to me. The inside covers are a joy to look at. I would not mind sitting down to a table that looked like that. I have to say I do have a soft spot for freshwater pearls. There is something very special about how natural they are in shape and colour. 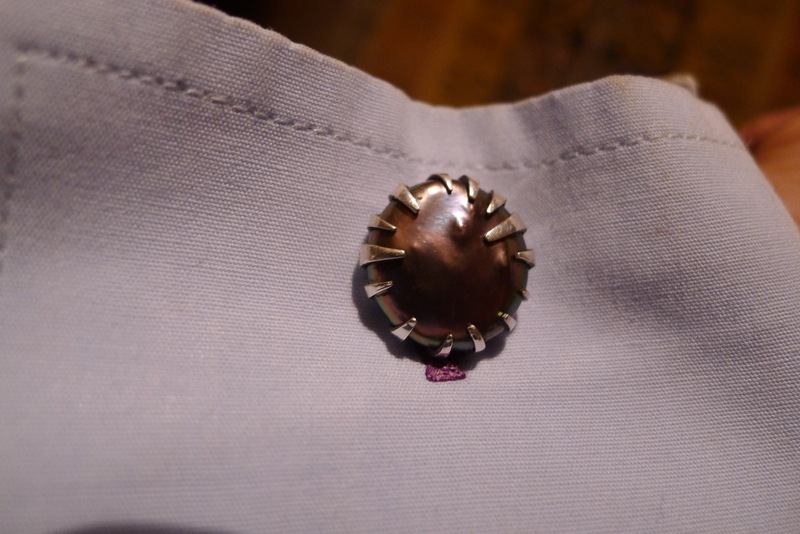 My friend Shira is a great jeweller and for Christmas she sent me a pair of freshwater pearl cuff links. In most years Shira would be here at this time of the year and some of her inspiration comes from the seed heads in the garden at this time of the year. This makes the gift even more special, I was very touched to get such a gift. You can see more of Shira’s work my using google, type ‘Wandering Jeweller’. Maybe a visit in summer up to the vegetable garden could give new inspiration for a summer collection. Today was a good day to sit down and to make my seed order for next year. I am looking forward to sowing them already. It is very interesting to read all about need seed on the market and to try things that I have not tried before. I think the important thing is to order a lot of what you already know and then look out a few new things to try each year. The list will now be sent out to my friend Kyle in the states who will order the seed for me, there will be a telephone call at some point when Kyle points out other things I should try. I still use pen and paper, I am so slow at typing. The great news for us up in the northern part of the world is that we have passed the shortest day, and that means that you lot in the south have passed your longest day, sorry. It is something I look forward to because day length has such an effect of life. This week I am having to wait till 6:50 to take the dogs for their walk in the woods and it is hard to be out in the garden after 16:20. The new year will be here before too long. But for now we are getting hit by another storm. The weather has changed down here in the South East of England. It has not got a lot colder but the rains have started. This is the time when getting on the soil is not a great ideaas you are going to do more bad then good. Since I am up to date with the digging it is not a problem. It is now a good time to start to make your seed order. If you get in early with the order there is a high chance that you will get the seed you want. With a good note-book this job can be carried out in rather quick time.